Making mud pies is a rite of passage of sorts for children. However, the Edgefield Clay Studio hopes to turn that passing fascination with mud into a life-long appreciation for the art of pottery. Most citizens of Edgefield County are probably familiar with the new pottery studio that has opened in the town of Edgefield, but few may realize that Edgefield Clay Studio is not just for adults interested in making pottery pieces. Paula Bowers, Manager of Edgefield Clay Studio, recently spoke to The Advertiser to expound on the opportunities available to explore this unique and historically relevant art medium for young people in and around Edgefield County. Edgefield Clay Studio introduced its first children’s classes, Mud Bugs and Mud Masters, in mid-March and their next round of these classes will begin May 16. These classes, for ages 6-8 and 9-older, respectively, teach hand building with clay. The classes meet for two hours one day a week and run for six weeks. Participants and their creations will be celebrated at the end of the six week term with a Student Show. 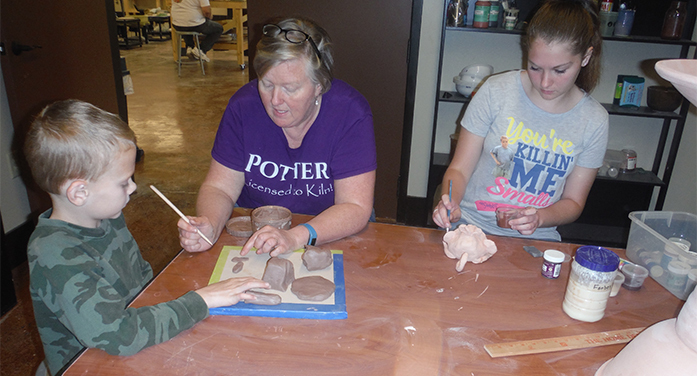 According to Bowers, these classes offer extensive pottery instruction and many opportunities for young students to create several different works of art. However, if 6 weeks is too much of a commitment, then a Saturday morning may be more suitable. From 10 a.m. to 12 p.m. on Saturdays, Edgefield Clay Studio hosts “Open Studio.” Bowers shared that these mini-classes, which are open to both children and adults, are ideal for those who are interested in but uncertain about the art form or pottery and want to test it out before committing to a longer term class. During Open Studio, participants are given basic hand building instructions and are able to construct their own pottery pieces. Appointments are necessary, however, for Open Studio as space is limited, and children under 18 must be accompanied by an adult. Beyond these endeavors to provide pottery opportunities to children, Edgefield Clay Studio is available for specially scheduled small group classes. In fact, the studio recently hosted such classes for several area home schooled students from across the CSRA, some of them from as far as Evans, Georgia. Using the Open Studio format, these classes offered basic instruction in hand building with clay but also incorporated science and history as well as Bowers shared information with students on the components of the clay and the history of pottery in Edgefield County. Learning that pottery is a process, students first made their projects on day one, glazed their fired works in a following class, and on a third day, picked up their final creations. (There were two firing stages that Bowers took care of during the process.) Classes such as these can be set up through Bowers by calling the studio, and discounts are available for larger groups. In addition, Edgefield Clay Studio also hosts children’s birthday parties. These parties can accommodate up to 15 people, and they last for 2 hours. The children spend the first hour and a half receiving instruction and constructing their works of art. The remaining thirty minutes is devoted to traditional party activities and ice cream. The cost of these parties is $20/person and, again, can be arranged by calling Bowers at the studio. Potter and Clay Studio Manager Paula Bowers instructs Asher and his sister Chloe in a special class for homeschooled children. 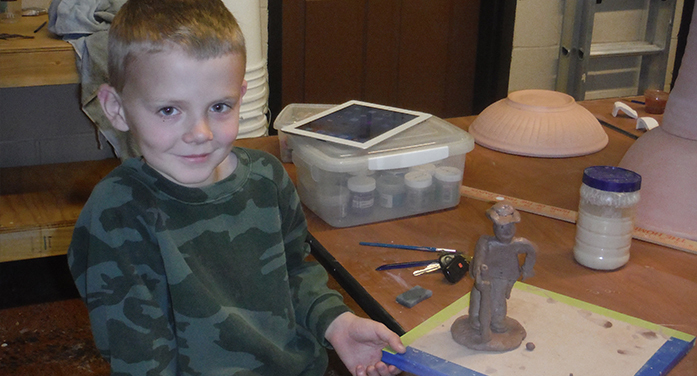 The Edgefield Clay Studio still has space available for its summer camps. However, those interested in participating are encouraged to call to reserve a spot in their desired camp as soon as possible. To reach the studio, call 803-336-4666. One may also sign up for classes or camp at the studio’s website, www.edgefieldclaystudio.com, or by visiting the studio at 310 Buncombe St. during regular business hours, Monday-Saturday, 10 a.m.-4 p.m. Be sure to visit the studio’s Facebook page for the latest updates on events and to see examples of art already created by area budding potters at Edgefield Clay Studio.